With the extreme weather temps we have been experiencing and with summer knocking on our door, check out this informative video to ensure your projects look great for years to come! For more information, contact us by calling 1800 331 012 or email us here. How many LATICRETE Products can you Spot? 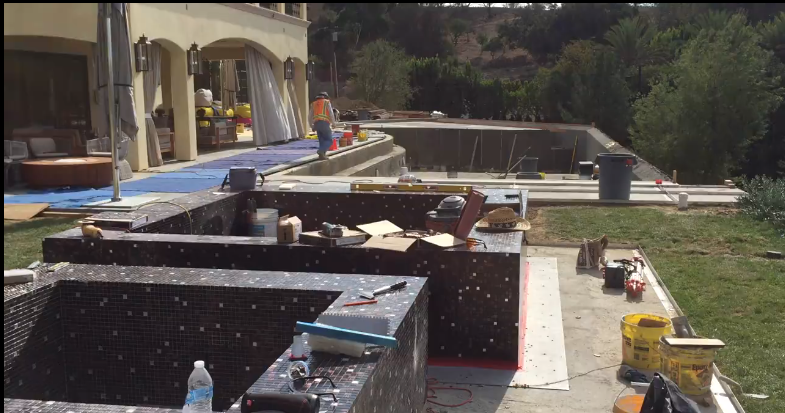 A pool project currently underway by Rock Solid Tile, Inc and David Penton of Fluid Dynamics Pool & Spa. 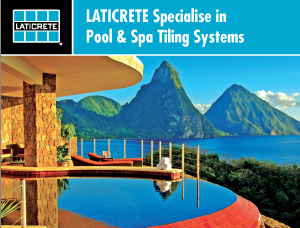 The LATICRETE Pool, Spa and Fountain Tiling System brochure is composed of time and job proven LATICRETE tile installation products which have been successfully installed around the world for over 50 years. It provides single source responsibility for these demanding, high performance applications. 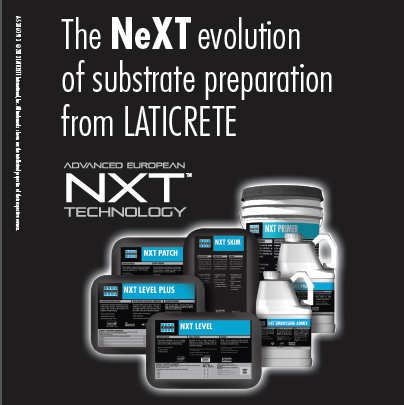 The LATICRETE System offers the latest technology in construction materials and methods, delivering superior performance for every pool, spa or fountain tiling system. Click here to view/download our comprehensive brochure. 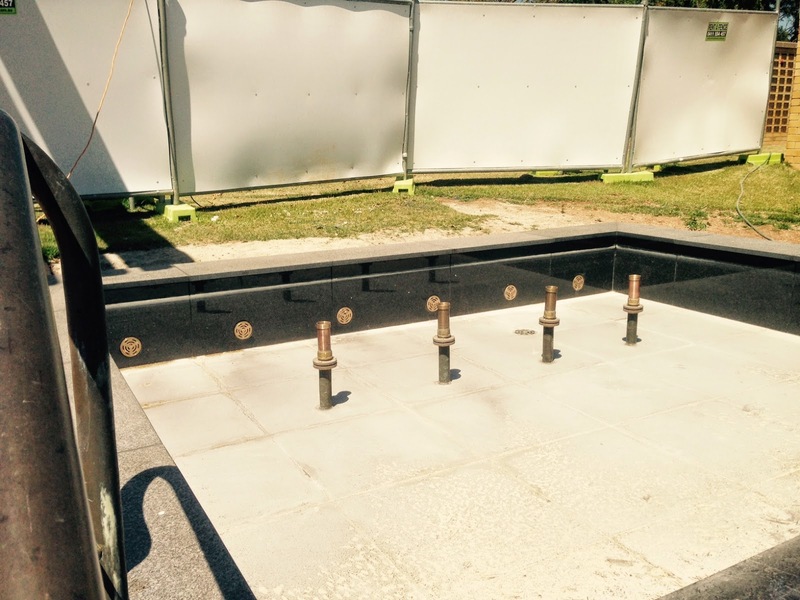 Have you seen our Tiled Swimming Pools, Fountain and Spas Technical Design Manual? This great design manual is available online to either view/download. Click here to obtain your copy. Contact us to discuss your next project, request free samples and or arrange a demo by calling 1800 331 012 or email us here. 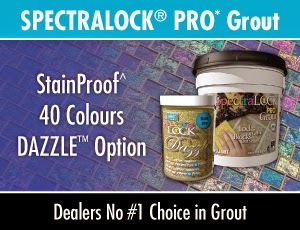 SPECTRALOCK® PRO Grout is a patented, high performance epoxy grout that offers colour uniformity, durability and stain resistance with extraordinary ease of use. Designed for use on ceramic tile, glass tile and stone applications, both residential and commercial. It can be used both interior and exterior on floors and walls. 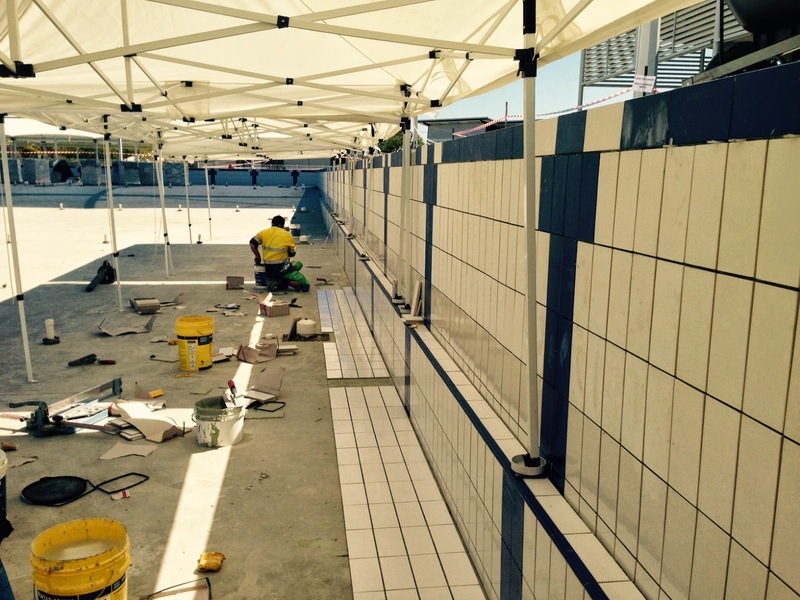 Ideal for re-grouting applications, SPECTRALOCK PRO Grout is perfect for swimming pools, fountains and other wet area applications. 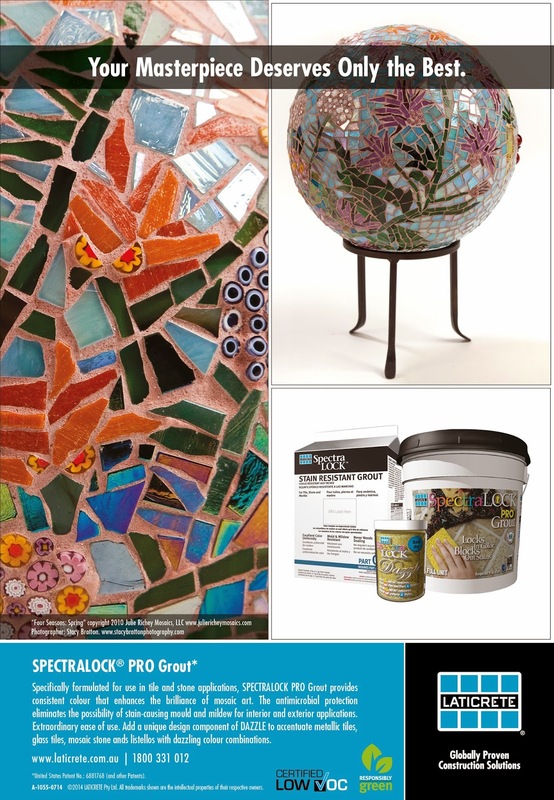 With SPECTRALOCK Grout DAZZLE™ there are a lot of combinations of "StainProof" grout available for your installation - not to mention the glow-in-the-dark component! Click here for more information. Contact us to request your FREE sample or request our paper Grout Colour Chart. Our Grout and Sealant Colour Chart is also available as a PDF online to view or download. Are you a Distributor in need of upgrading your LATICRETE Grout Channel Kit? Contact us here or call your local LATICRETE Technical Sales Rep on 1800 331 012 for more information. Have you seen the latest issue of the Pool+Spa mag, Nov/Dec Vol. 3 No. 5? LATICRETE have the products, systems and warranties for the installations of pools, spas and fountains. Take a look at our brochure here. Contact us to discuss a customised specification, your next project or arrange a demo by calling 1800 331 012 or contact us here. 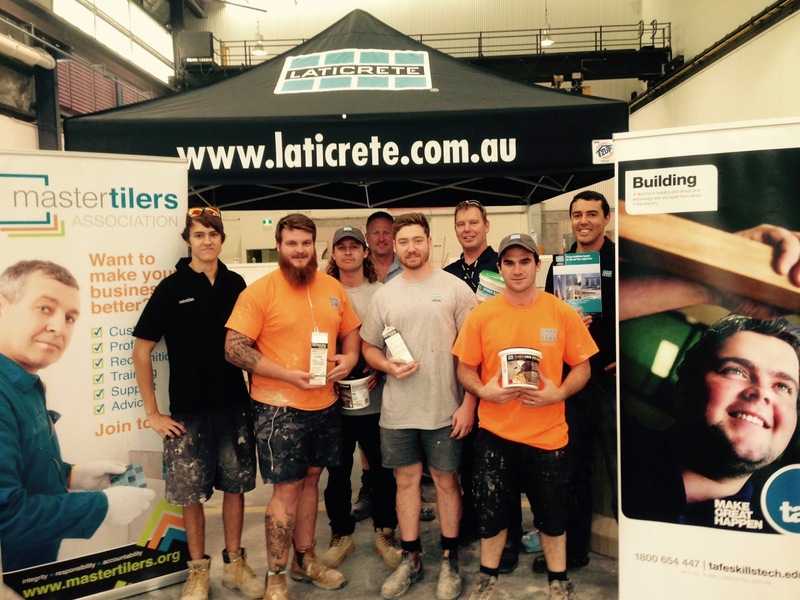 The LATICRETE Technical Sales team were at SkillsTech TAFE in QLD providing training on LATICRETE materials. The apprentices were truly impressed and can't wait for the next training day. Interested in training for your team?! We provide in-house training or training at your premises. We work with you to provide customised training. Check out our Profit Through Knowledge (PTK) Training Schedule. Contact us to discuss your training requirements. 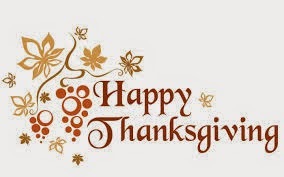 Call 1800 331 012 or contact us here. 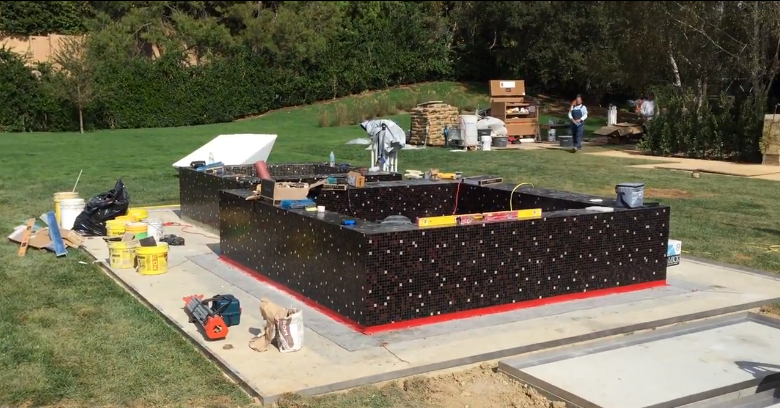 A great and informative video by WATERtv, Stonecrest Pools Inc. and Rock Solid Tile Inc.
"Having a tile finish plan from the landscape architect or designer proves vital to the project success. The finish plan will help save time, money on project cost and delays. 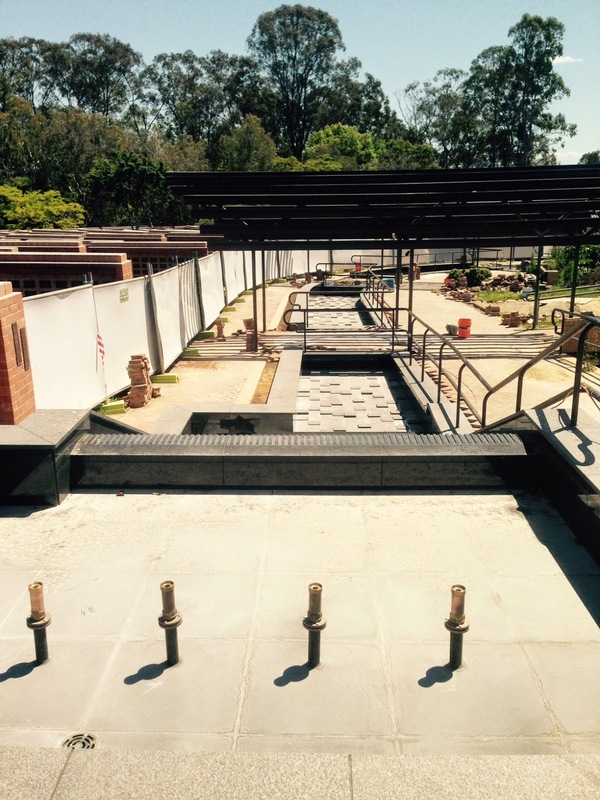 It will also help in quality control and expectations from the client and Landscape architect. Glass tile is very appealing in submerged applications. Its jewelry in the garden! Key things to consider in tile selection is absorption rate of tile, high coefficient of friction be freeze/thaw resistant, resistant to moisture expansion and chemical resistant. Selection of mounting method for glass tile is also key for great installation. Paper face or plastic mounted glass tile is important for the selection of glass tile and the success for quality installation for glass tile swimming pools. This method insures good coverage of thin set and provides great bound to the thin set and glass tile. Mesh back tile is another option but making sure what type of mesh and glue is used from tile manufactory is important to make sure you have quality mesh back tile. Stayed tuned to WATERtv for the release of the first ever submerged tile training video brought to by WATERtv and Team Laticrete." 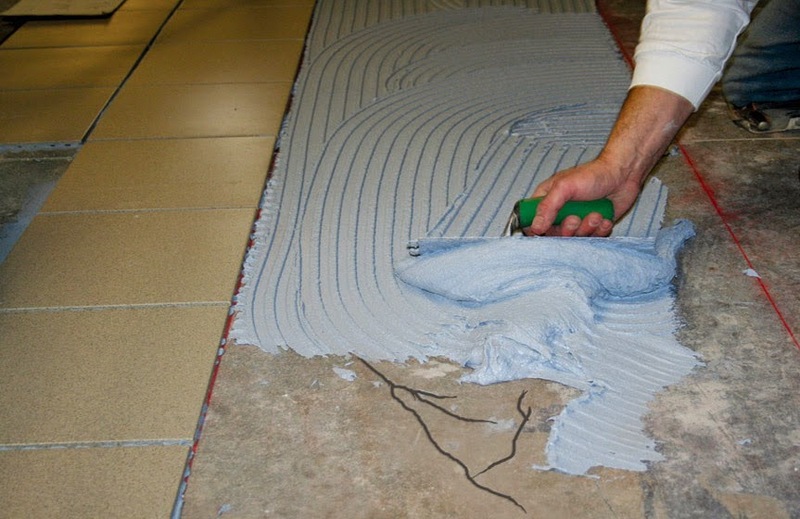 Conventional Portland cement tile-setting beds, thin-set mortars, cement plasters and stuccos are often permanently damaged when subject to hot, dry temperatures or desert climates immediately after installation. High temperatures remove the water content of the mortar required for Portland cement hydration, curing and strength development. 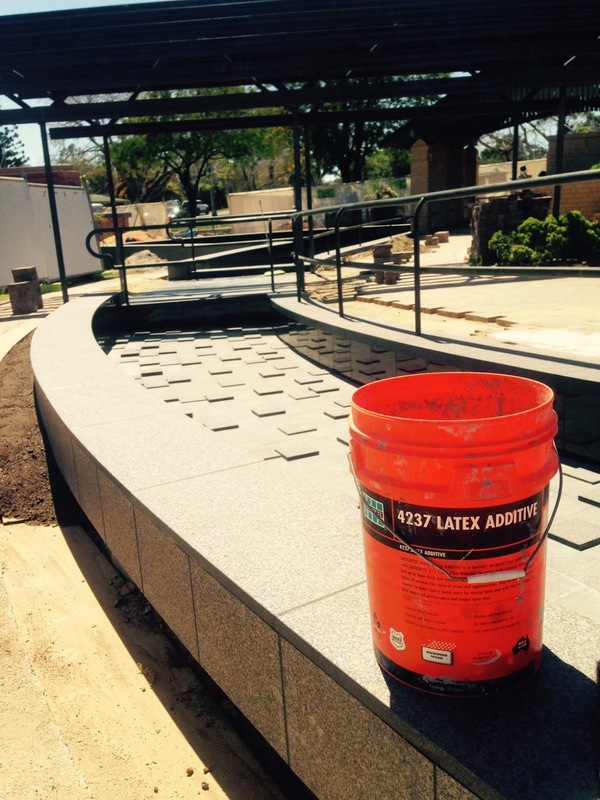 In addition, rapid drying often causes mortar to crack, crumble or lose bond. Waterproofing membranes, anti-fracture membranes, epoxy adhesives, epoxy grouts, epoxy waterproofing membranes and most other products will also be affected by hot working temperatures. Flash setting and reduced working time can result. It is important to note that surface temperature is more important than air temperature. Therefore, monitor the surface temperature of the installation. 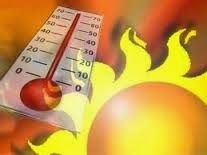 With the extreme high temperatures we are currently experiencing, there is a simple rule to follow when an installation is subjected to high temperatures: The 10ºC Rule – for every 10ºC above 21ºC, Portland cement and epoxy based materials take half as long to cure. Got your attention? Click here to continue reading. For more information contact our Technical team by calling 1800 331 012 or email us here. Listen - No More Noise! 125 Sound & Crack Adhesive has been featured in the Ecospecifier October newsletter. Take a look here. For more information and to view an installation video, click here. Contact your local LATICRETE Technical Sales Rep on 1800 331 012 for more information, technical assistance, discuss your next project or contact us here. Mosaicists Have You Seen Our Advert? 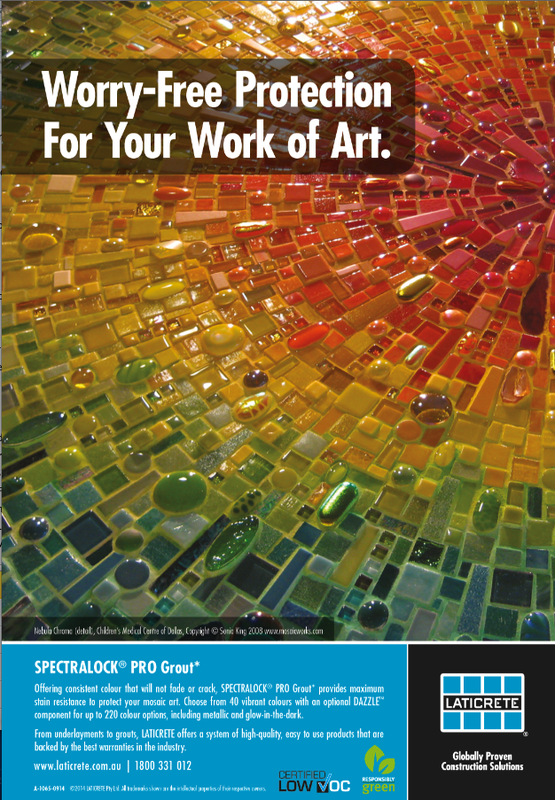 Offering consistent colour that will not fade or crack, SPECTRALOCK PRO Grout provides maximum stain resistance to protect your mosaic art. Choose from 40 vibrant colours with an optional DAZZLE™ component for up to 220 colour options, including metallic and glow-in-the-dark. Click here for more info and to view an installation video. From underlayments to grouts, LATICRETE offers a system of high-quality, easy to use products that are backed by the best warranties in the industry. 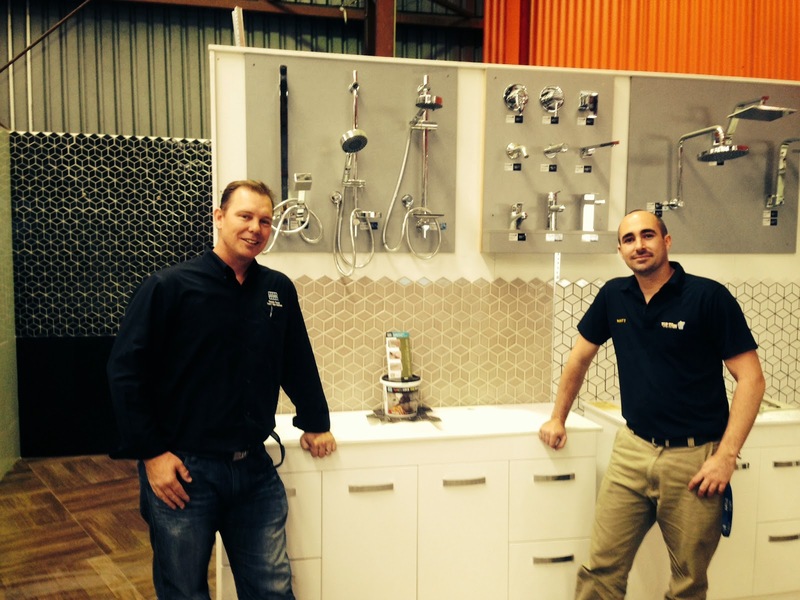 Contact us on 1800 331 012 for technical assistance, arrange a demo, trade event, FREE samples or email us here. 4237/211 - click here for more info. Contact us on 1800 331 012 or contact us here for more information, request samples, arrange a demo or chat to your local LATICRETE Technical Sales Rep for technical assistance. 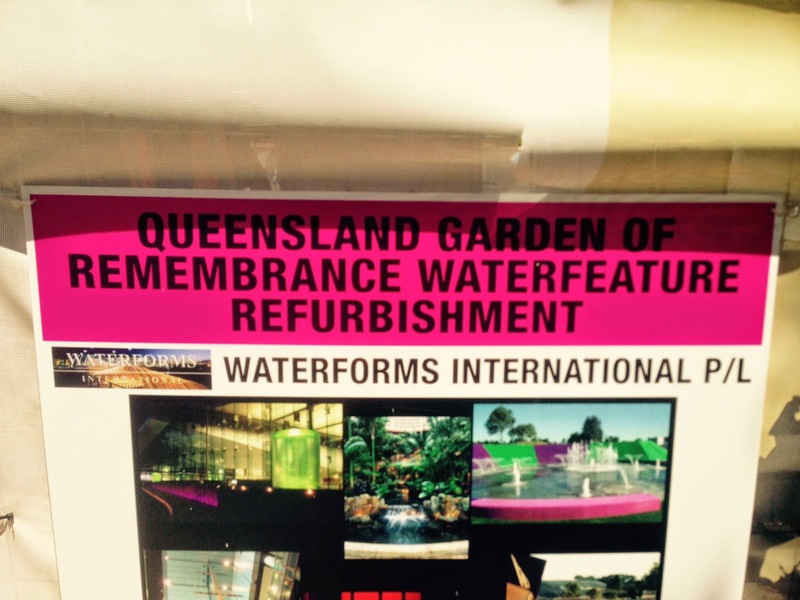 This refurbishment is being done by Waterforms International Pty Ltd.
NXT Level Plus & NXT Primer is part of the FREE promo offering! *LATICRETE Stockists - have you put in your order to secure this great promo? *Tile contractors - we also have a great offering for you - view your promo here. 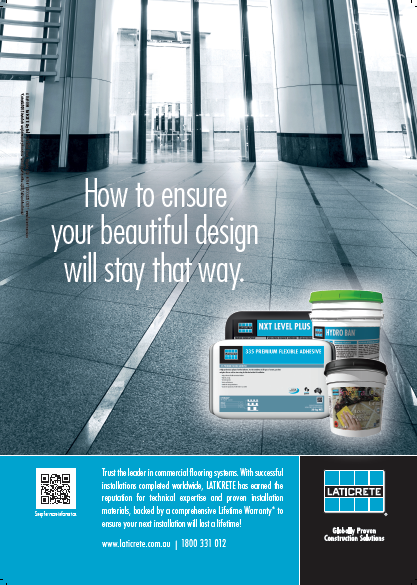 The LATICRETE products in this brochure are recommended for "rapid open to traffic" installations of tile and stone. An overview of each recommended LATICRETE rapid product is provided as a general guide to facilitate the selection of the appropriate LATICRETE rapid setting product for the specific application. Click here to view/download the long form Time vs Temperature Installations charts, or go to our website to view product application videos, Architectural Specifications, Architectural Details and comprehensive technical support. Provided that tile and stone are installed in accordance with applicable industry standards and written LATICRETE installation instructions, projects utilising LATICRETE rapid products can qualify for a comprehensive LATICRETE System Warranty. Click here to continue reading/download this brochure. Contact your local LATCRETE Technical Sales Rep on 1800 331 012 or email us here for more info, request samples or to arrange a demo! Great Systems for Commercial Floors! 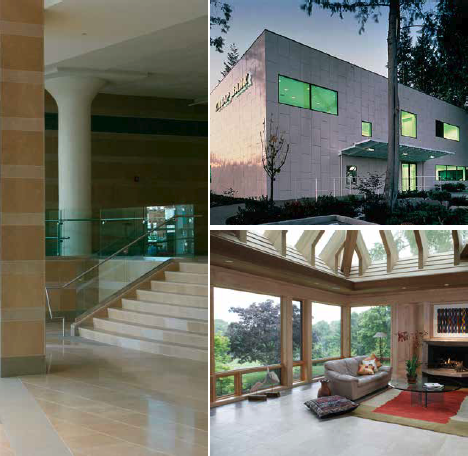 LATICRETE Commercial Floor Systems meet the demanding requirements of commercial installations by providing low maintenance installations with maximum durability and chemical resistance. 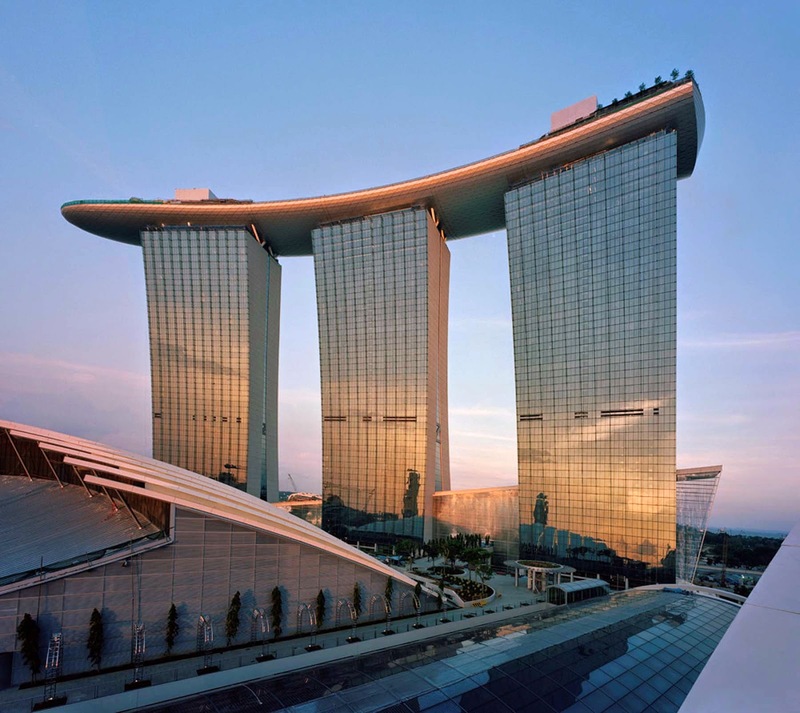 Composed of adhesives, waterproofing and crack suppression membranes, underlayments, mortars, and grouts, these systems provide permanent, problem-free installations and single source responsibility. The LATICRETE® System is composed of high performance installation materials for all types of ceramic, porcelain, mosaic, quarry, agglomerates, and stone. The LATICRETE System, job proven for over 50 years, helps these finishes to perform. 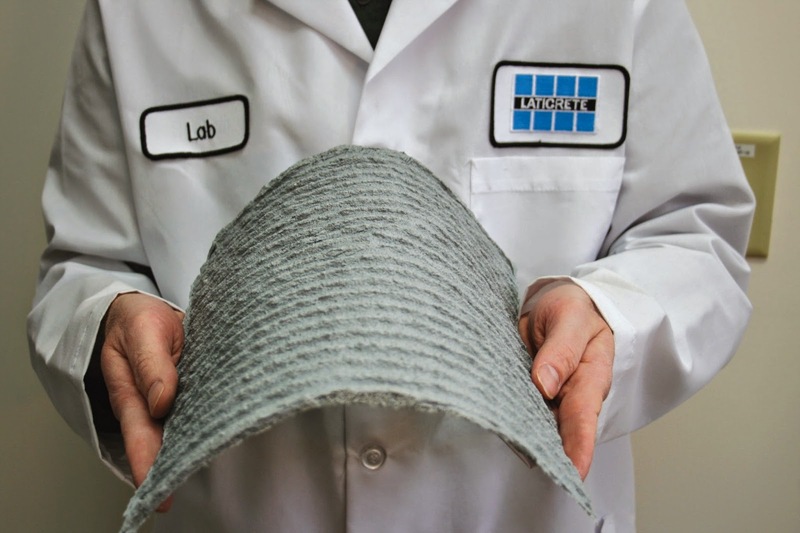 The LATICRETE System provides the latest technology in construction materials and methods to deliver superior performance. Click here to view/download this brochure. Contact your local LATICRETE Technical Sales Rep for more information, technical assistance, discuss your next project, arrange samples or a demo by calling 1800 331 012 or contact us here. Our very own Fred Gray, LATICRETE Technical Service Manager had provided MAANZ with an article which was published in the August 2014 issue of MAANZ. 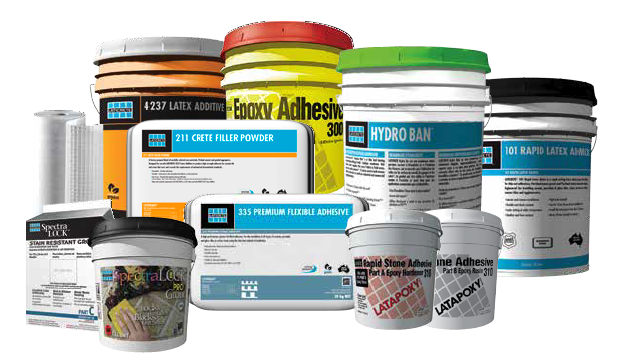 In this article Fred shares some essential information on: "Substrates, Grouts and Adhesives." "Over the last twenty years or so I have had many discussions with glass mosaic artists and hobbyists about their projects and installation methods only to find that poor choices have been made when it came to the selection of the backing or substrate for their projects. These choices have ultimately lead to the works not being suitable for the very area they were first commissioned for. Choices were made without understanding the ramifications of the likely use and exposure. 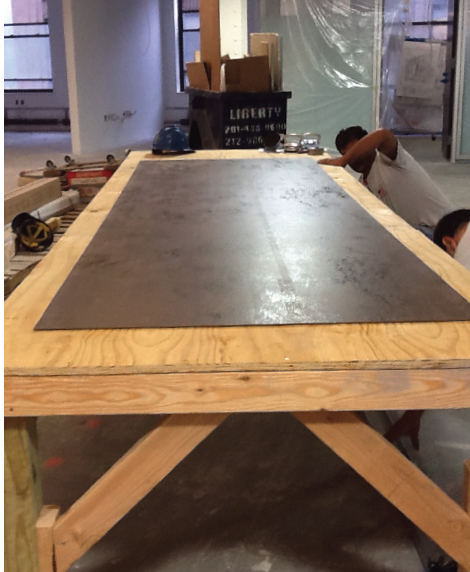 For instance using plywood for table tops that are going to be used externally. Even exterior grade plywood, which may be ok for internal use is not suitable for external use with glass tiling over even when waterproofed. 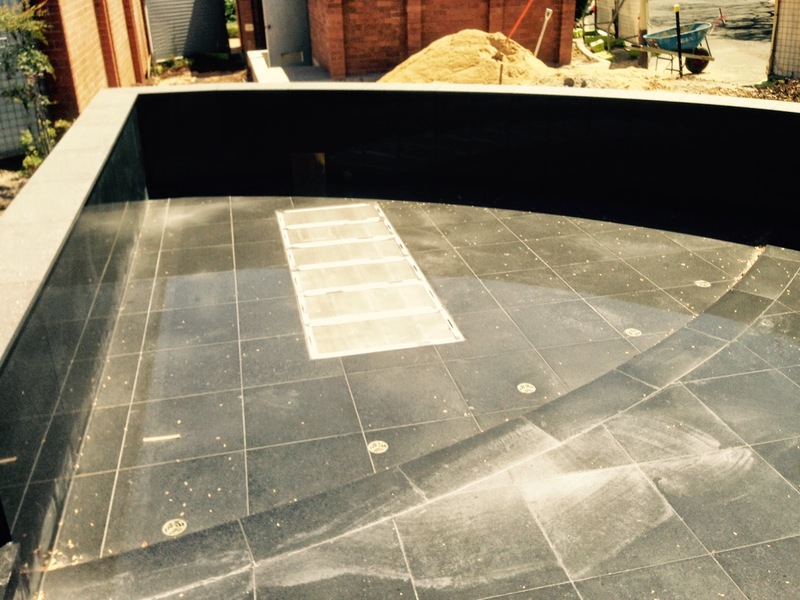 Look out for the new type of foam boards like Wediboard or Marmox which are favourable types of substrate for external works around water features and the like. Read more. Contact us for technical assistance, discuss your next project, request free samples by calling 1800 331 012 or contact us here. 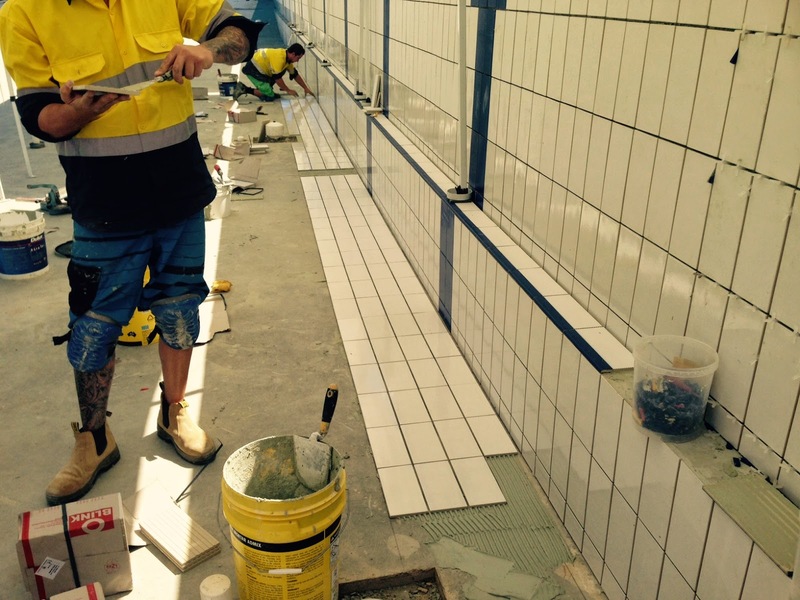 Nick Collett, LATICRETE QLD Technical Sales Rep, was recently at the above job site providing technical support on this 450m2 tiling project where Trend Q tiles and SPECTRALOCK® PRO Grout were used. SPECTRALOCK PRO Grout is designed for use on ceramic tile, glass tile and stone applications, both residential and commercial. It can be used both interior and exterior on floors and walls. Ideal for re-grouting applications, SPECTRALOCK PRO Grout is perfect for swimming pools, fountains and other wet area applications. Click here for more information and view an installation video. Contact us by calling 1800 331 012 for more information, arrange a demo, technical assistance, arrange your free sample or email us here. 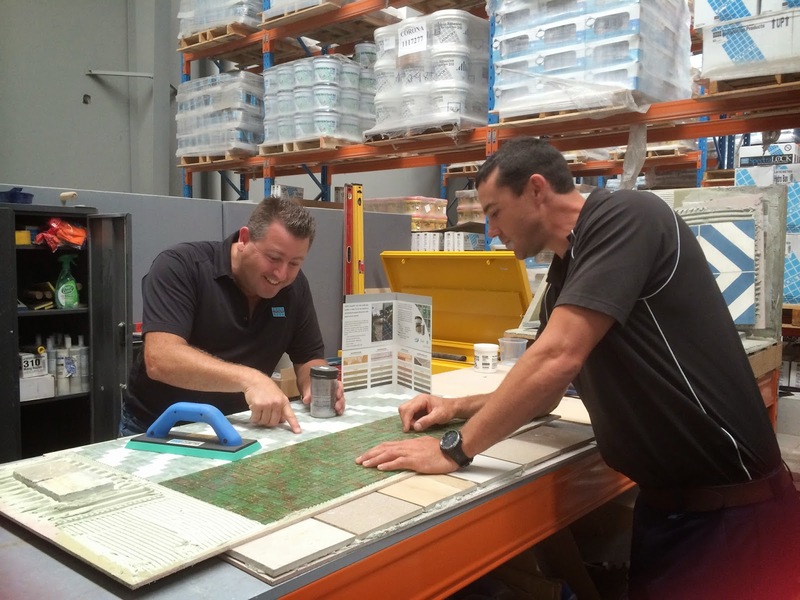 Attend a free installation demonstration presentation this Friday, 7 November on Slimline Tile at: C block, TAFE SkillsTech, 247 Bradman st, Acacia Ridge, QLD. LATICRETE and PANARIA will present the demonstration. The product size will be 1000 x 3000 x 3.5mm – total weight 21 kgs. RSVP by Thursday, 6 November to info@mastertilers.org or just turn up on the day. Proudly supported by the TAFE Queensland SkillsTech, Australian Master Tilers Association www.mastertilers.org and Metro Tiles. 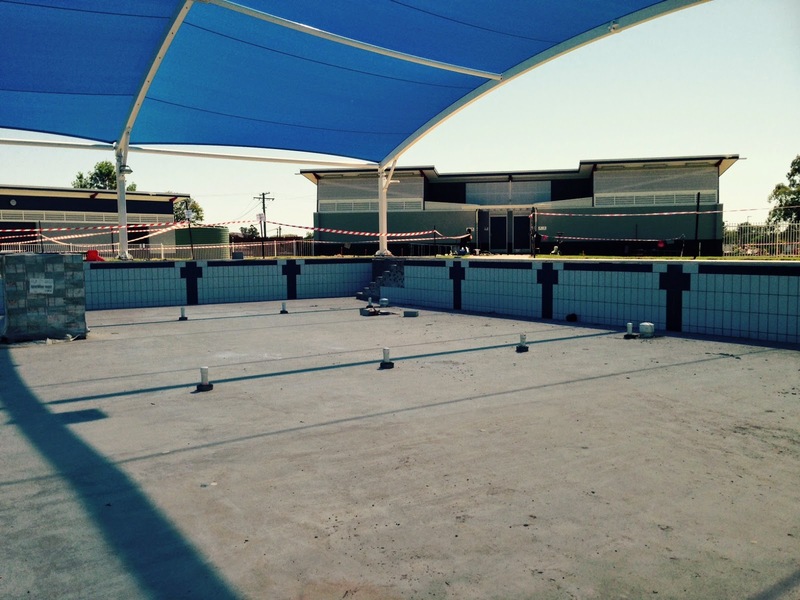 LATICRETE was the choice of installation materials for the "smaller" pool, which we blogged on in August. 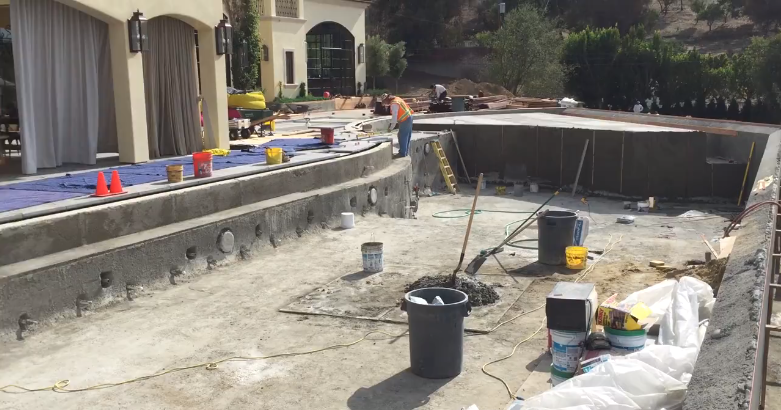 We are excited to now share in this new 50m2 pool project, which is currently underway. That's correct we have MULTIPLE product promotions and the great news is, these fab promotions will run until 30/1/2015. Haven't used these products before?! Contact us for technical support, advise or to arrange a demo, or a FREE sample by calling 1800 331 012 or contact us here.